If the Tube Screamer is the quintessential overdrive, then the DS-1 is its distortion counterpart. Cheap, available, it’s used by players from Steve Vai to Kurt Cobain. First introduced in 1978, the Boss DS-1 was initially based around a Toshiba preamp, rather than the op-amp that would be used for later iterations of the circuit. This circuit resulted in a warm distortion tone, which was made gritty by the hard-clipping diodes placed after the amplifier stage. Although its tone is more angular, the ProCo Rat employs a similar hard-clipping action, and this is what tends to characterise a distortion versus an overdrive. The Tube Screamer, by comparison, has a soft clip, with diodes placed in the feedback loop of its op-amp. As the first distortion that Boss released, it has gone on to define the compact pedals that have come after. Probably the only pedals as recognisable as the DS-1 are the DM-2 analogue delay, BD-2 Blues Driver and DD-3 Digital Delay. The pedal was subsequently revised in 1994 as the Toshiba IC in the previous circuit was nearing the end of its life, and a revision was released that employed a ROHM op-amp. The result was a cleaner distortion that could go from a bit of hair to full-on square wave - at the cost of being relatively quiet. Finally, in 2000 the pedal was given its final revision. A Mitsubishi op-amp resulted in the loudest of the DS-1 versions, but at the cost of introducing a certain amount of ‘fizz’ at higher gain levels. It is this version of the pedal that has attracted the most flak, but it’s also this version that has been the most widely modded, with Keeley and Analogman mods taking it from average-sounding to stellar. The tone stack on the DS-1, interestingly enough, is quite similar to that found on the Electro-Harmonix Big Muff. It is essentially a tilt around a low-mid scoop. Unlike pedals, such as the Tube Screamer that boost the mids, the DS-1 cuts at around 500Hz, leaving the treble and bass substantially louder at the mid-point of the control’s rotation. Arguably, this EQ curve is more suited to hard rock, especially if you roll off excess bass at the amplifier end. The level control passively attenuates the output of the pedal. The Tube Screamer can offer about 40dB of gain, while the ProCo Rat has nearly 70 on offer. The distortion control on the DS-1 controls the gain from the second op-amp amplifier stage, which can dish out about 25dB when cranked. Don’t be fooled by this number, however - the pedal has a fixed transistor boost of 35dB on the input, and is followed by the first op-amp buffer stage, meaning that fully dimed, the guitar signal will be nearly as square-wave as one that’s been mangled by a Big Muff. Used by DS-1 aficionados like Kurt Cobain, the DS-2 was Roland’s first attempt to evolve the circuit. 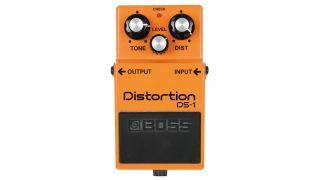 Tonally similar to the DS-1 in mode 1, it could be switched into a second mode that brought the mids more forward, lessening the eff ect of the tone stack’s scoop. Apart from that, its controls of level, tone and distortion were identical to those found on the DS-1. A development of the core idea of the DS-1, the HM-2 goes overboard, with soft clipping diodes, hard-clipping and crossover distortion all combining to make the ‘chainsaw’ sound so beloved of death metal guitarists. Although the circuit was more complex, with two controls for EQ in addition to the changes already mentioned, this cult classic wouldn’t have been possible without the DS-1 paving the way. The most hated pedal Boss has released, the Metal Zone is nevertheless one of their best-sellers. Boasting a ludicrously powerful EQ section, it builds on the flexibility of the pedals that came before it, while, at its core, still being an op-amp based distortion with hard clipping. Like the original Rat, at higher gain settings the op-amp itself will clip, delivering a quite different sound. It’s easy to get huge, searing sustain out of the DS-1, but make sure you’ve got a noise gate handy if you plan on running it into a larger amplifier, as you’re likely to get a lot of feedback. Try these settings into a hairy Marshall and get your shred on. The guitar sound on Entombed’s Left Hand Path album was largely the DS-1’s successor, the HM-2, with one guitar panned left and right. Uffe Cederlund recently revealed there was also a DS-1 panned dead centre. As the counterpoint to much more saturated tones, the DS-1 can help fill out a mix, even when placed lower. It may be harder to emulate with the modern DS-1, but Cobain was known for prolifically using the pedal around the period of Bleach and then alternating between DS-1 and DS-2 thereafter. He reportedly turned the midrange up substantially on his Mesa preamps, so make sure your amp has plenty of mid presence.